Good morning. It is my great pleasure to be here with you all at this trade promotion forum. I am particularly glad that the Commercial Centre of Cambodia in Hong Kong will be officially opened today. I am confident that the Commercial Centre will further enhance the linkage between Cambodia and Hong Kong, and help step up co-operation between the enterprises of the two places, especially with the increasing mutual co-operation driven by the Belt and Road Initiative. Three months ago, I led a strong business and professional delegation to visit Phnom Penh of Cambodia. During my stay, I was much impressed by the openness, friendliness and rapid development of the country, and my delegate members were all enthusiastic about the potential opportunities being offered by Cambodia. In the visit, I said Hong Kong and Cambodia were much closer than we thought and together we could foster an even closer economic and trade relationship. 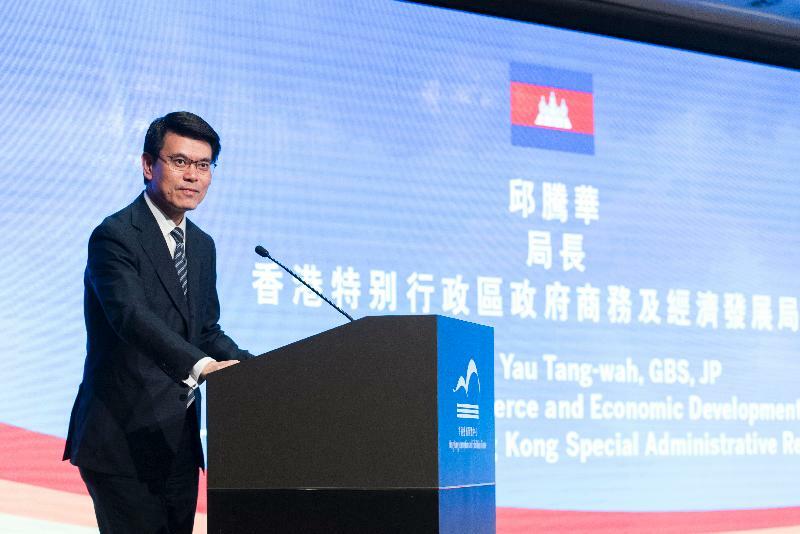 I am very delighted that in just a few months' time, our Cambodian colleagues are making a reciprocal visit to Hong Kong, joining the Belt and Road Summit held yesterday, and celebrating the opening of the Commercial Centre today. Being strategically located at the centre of Asia, and with established international trade networks, world-class infrastructure, well-connected communication and transport networks, Hong Kong is well placed to act as the Belt and Road platform of finance and professional services. The rich pool of professionals underpins our role as a key financial, trade and logistics centre in the region. As an important hub connecting China to the world as well as East and West in many aspects, we stand ready to be the springboard for enterprises in accessing the Mainland market and connecting this part of Asia with the world. The Belt and Road Initiative is not merely about business. 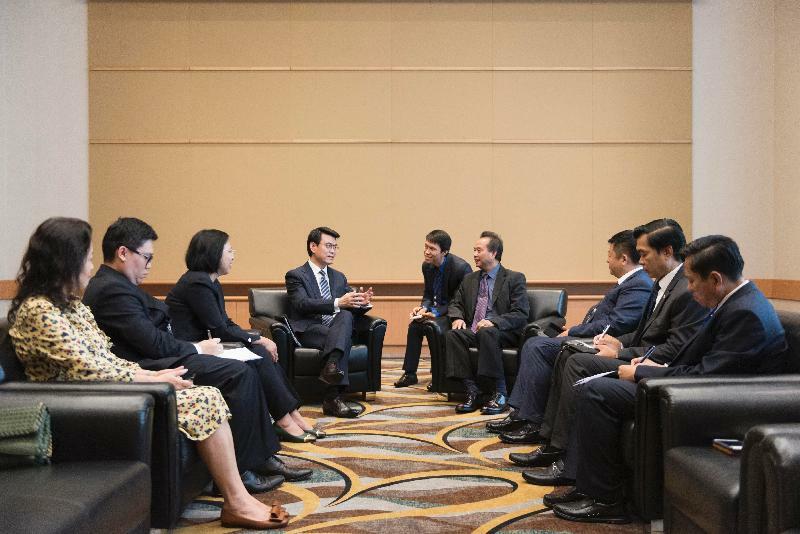 Hong Kong is also ready to partner with Cambodia in taking forward other aspects of the Initiative, such as cultivating the people-to-people bonds. I am glad to know that the business chambers of the two sides (the Chinese Manufacturers' Association of Hong Kong and the Hong Kong Business Association of Cambodia) are joining hands in taking forward a charity project that will provide medical assistance in 10 provinces in Cambodia which will benefit hundreds and thousands of local families. I believe this is just a start, and I would say a very impressive one, which certainly will pave a way for many more such collaborations between the two places. Over the years, Hong Kong has developed close ties with Cambodia both economically and socially. With the Belt and Road Initiative going ahead at full throttle, our relationship will only get stronger and stronger. Last but not least, let me wish all our Cambodian friends a joyful stay in Hong Kong, and the Commercial Centre every success in your future endeavours.